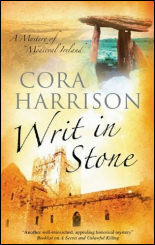 With her superb attention to detail, Cora Harrison brings medieval Ireland into vivid life, being equally skilful at portraying the good, the bad, and the ugly. 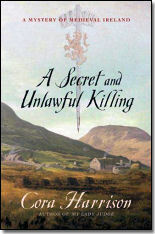 The USA cover of the second Burren Mystery, published as "A Secret and Unlawful Killing" in the USA. 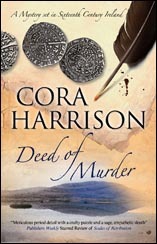 "With her superb attention to detail, Cora Harrison brings medieval Ireland into vivid life, being equally skilful at portraying the good, the bad, and the ugly. "Her research appears impeccable and is always included using a lightness of touch. "Mara is up there with the great fictional detectives. "Her formidable intellect is beautifully balanced by her humanity and ability to empathise even with those she dislikes. "She is a creation to be proud of and one assured a long stay on my bookshelves." A more clear-headed, sound Judge you couldn’t wish for and a wonderfully appealing character. "Christmas, 1510; the Burren, West coast of Ireland. Mara, Brehon (investigating judge) of the Burren, has accepted the offer of marriage made by King Turlough Donn O'Brien, ruler of that tiny kingdom of stony land and terraced mountains on the shores of the Atlantic Ocean. "Few will anticipate the solution. 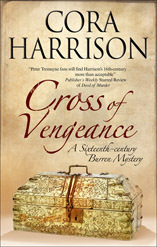 "Harrison combines meticulous period detail with a crafty puzzle and a sage, empathetic sleuth." 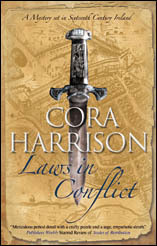 "The threat of Henry VIII's English army looms over Ireland in Harrison's outstanding sixth historical featuring Mara, "the Brehon" (or judge) for her community of the Burren in the west of Ireland (after 2010's Eye of the Law). With her royal husband, King Turlough Donn, away battling the earl of Kildare in Limerick, Mara survives a difficult pregnancy to deliver a premature but healthy boy. While Mara is still recovering from her ordeal, the unpopular local physician, Malachy, whose estranged 14-year-old daughter, Nuala, assisted in the birth of Mara's son, dies of poisoning. The arrival of a young legal scholar who could handle the inquiry into Malachy's death gives Mara the chance to step back and regain her strength, but she has misgivings about entrusting the peace of her people to a stranger." April 1511, Ireland. Mara, Brehon of the Burren, is celebrating the christening of her son when she notices that three of her law students have disappeared from the party. February, 1512. Mara, Brehon of the Burren, judge and lawgiver, has been invited to the magnificent city state of Galway, which is ruled by English laws and a royal charter originally granted by Richard III. It had been an early spring in the west of Ireland. In the kingdom of the Burren, mild south-westerly winds from the nearby Atlantic Ocean had put a temporary end to winter frosts by the middle of January. By the second day of February the sunken lanes in its valleys had been filled with pale yellow primroses and dark purple violets. Soon afterwards the willow had begun to quicken and burst forth into fluffy buds, the pink haze of the tiny herb robert spread over the ditches and the grass of the fields was sprinkled with cowslips. An early spring, said the optimists who began making plans for moving their cows to summer pasture. "One of Harrison’s most intriguing solutions." Booklist writes: "An unusual and beguiling murder mystery set in a sixteenth-century Ireland that is as lovely, innocent, and enchanting as Camelot—until murder befouls the setting. "Mara, the Burren Brehon (maker of judgments), is wise, patient, fair, and kind, but all of these qualities are tested when a band of religious pilgrims comes through the Burren. "Soon after their arrival, the Kilnaboy religious relic, which is the Burren’s most important attraction, is defaced and burned. Then one of the pilgrims is found murdered, his body spread-eagled and naked in crucifixion pose behind Kilnaboy Church. "Determined to find the killer, Mara is completely puzzled: How did someone kill the pilgrim, who was a big man, remove his clothes, and haul him to the site where he was found? Was the killer one of the pilgrims or, more frightening, someone from the Burren? "Cleverly written, atmospheric, captivating, and suspenseful, this is a unique murder mystery that’s sure to appeal to fans of historical mysteries." 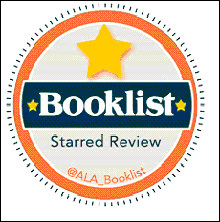 Net Galley review: "I try very hard to save five star ratings for books that really make a special impression on me. This was one of those books. I've read other books in the series and have always enjoyed them very much, but this one was so full of suspense and tension that it catapulted onto a different level. "This novel had a plot which was so well constructed that I never guessed where the author was leading. The mystery involved would have been entertaining enough by itself, but when the additional plot element was introduced it signalled a change in the whole dynamic of relationships long established and hints at new possibilities for future novels. "Needless to say, this author has added material which will enable her to continue to develop this series over a long period of time. Definitely an absorbing reading experience and highly recommended for readers who enjoy historical mysteries." 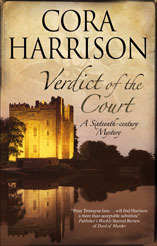 Publishers Weekly review: Harrison has never been better than in her 12th historical starring Irish investigating magistrate and law school dean Mara (after 2014’s Verdict of the Court). Under Irish law in the 16th century, murdering a close relative is punished by setting the guilty party out to sea in a boat without oars. When a boat without oars containing the body of an unidentified man drifts onto the shore of the Kingdom of the Burren, the locals assume that the dead man must have been a kin-slayer. Mara’s oldest scholar, Domhnall, later tells her that he thinks he recognizes the corpse as that of a goldsmith from Galway, a city farther up the Atlantic coast that’s governed by English law, which punishes kin-slayers by hanging. Mara concludes that someone murdered the goldsmith and hoped to disguise the cause of death. 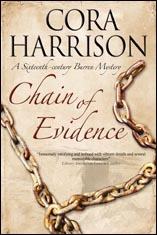 As Mara’s sleuthing leads her to a clever and disturbing solution, Harrison seamlessly integrates law and social history (e.g., Mara notes that the emergence of the merchant profession obligates setting a legal penalty for killing one). "This is an interesting and intriguing mystery with a background which reminded me of Peter Tremayne's Sister Fidelma mysteries though set nearly a thousand years later than that series. Mara herself is an interesting character and clearly shows that in some civilisations and eras women could become powerful and were given the same educational opportunities as men. "I adore the Burren mysteries and have read every single one but this one was surprising in its ending… this wonderful and truly historically correct in every way series will be continuing. I checked all these places out recently in Ireland. Spent part of a day at Bunratty Castle Verdict of the Court was set and chattered on about Turlough. 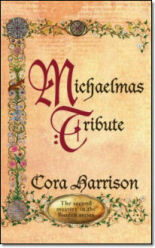 It is imperative that you start this series if you like Irish, Medieval or Historical Mysteries, or just a great read." "Another wonderful story. Mara is one of my favorite book characters." 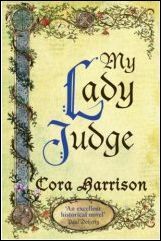 "Cora Harrison always does such a wonderful job of placing me right in the time period of these novels, the sixteenth century… All of this carried out by a woman whose word was considered as binding and had to be obeyed as if the instructions had been spoken by the king. These novels are always an interesting learning experience to see how advanced the culture was regarding the appreciation of the capabilities of women." HISTORICAL NOVELS SOCIETY EDITORS' CHOICE "A terrific read"
"To say that Clodagh O’Lochlainn wasn’t well-liked is an understatement. After her strangled body is found roped to a stone pillar in the valley of Oughtdara in southwestern Ireland, the list of suspects grows longer by the day. Her husband Aengus, a gentle shepherd, had endured her foul mouth and shameful taunts for a good forty years. A short time earlier, Clodagh had won – maybe by cheating – a legal case against her four male cousins, which gave her the rights to her late father’s lands. Or maybe the Fár Briege had killed her, the ancient stone god himself. To many villagers, this is entirely possible, for belief in the Tuatha Dé still runs strong in the year 1523. 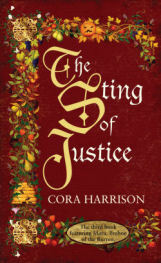 Tasked with rooting out the murderer is Mara, Brehon of the kingdom of Burren, the same judge who’d recently awarded the verdict in Clodagh’s favor. "Mara makes for an ideal yet unique detective. She knows everyone, and her forthright manner tolerates no nonsense, but she’s also wise enough to let the pupils in her law school share their opinions. These include her near-adult grandson and her young son, one of whom shows strong aptitude in law, while the other merely goes through the paces. Caring and observant, Mara spends considerable time pondering her family’s future, and that of her friends. "As new leads emerge in this complex mystery, her investigations take her all over the countryside, interviewing both rich and poor. The novel is set almost wholly outdoors, and although late March brings gusts and rain, the land is a vision of stark beauty, with great swaths of rock interspersed with tufts of green, and heavy mists occasionally obscuring the nearby mountains, sky, and ocean. The Irish legal system is fascinating to learn about, too. This is a terrific read for anyone wanting immersion in another time and place." "...To weave a satisfactory mystery in with the history of the O'Davoren clan of law scholars and the O'Briens of Thomand, Corcomroe and the Burren is masterful indeed. I recommend you start at the beginning of this fine series. 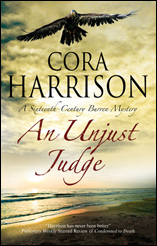 Cora Harrison's historical detail and her perspective on the period never fails and the characters are vivid and memorable." "...Mara is indeed a woman to be admired. Her mind is swift. She is reflective and powerful in her understandings, yet always lovingly heeding the situations of the people involved... Another engrossing novel set in the late Middle Ages in Ireland, reflecting a rich heritage of law and Justice attuned to the peoples of the land, a sophisticated and often compassionate system to be admired, more communal than adversarial." "Mara, Brehon of the Burren, a sixteenth-century Irish kingdom, investigates the vicious murder of a novice judge from a neighboring kingdom, who meted out exceptionally harsh punishments for minor crimes his first and only day on the job. "Though her initial suspects are the five men who received unjust sentences from Gaibrial O’Doran, she quickly realizes that there are a slew of others with probable cause, including O’Doran’s young wife, an abused apprentice, and another would-be Brehon. "The heinous nature of the murder suggests either a crime of passion or one of unflagging ambition, and motives abound. "Mara, aging gracefully, has lost none of her investigative ability or her sharp powers of investigation. 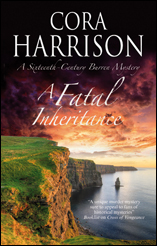 The narrative twists and turns until the end, showcasing both Harrison’s clever plotting and the historical chops as she continues her outstanding Burren Mystery series, following A Fatal Inheritance (2016). 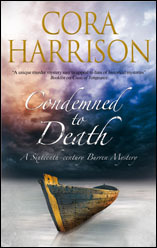 "Like Peter Tremayne in his Sister Fidelma series, Harrison illuminates the remarkably enlightened legal system of medieval Ireland." 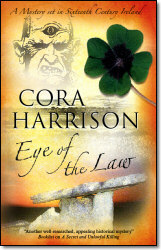 "This is the fourteenth Burren mystery, set in western Ireland during the reign of Henry VIII. 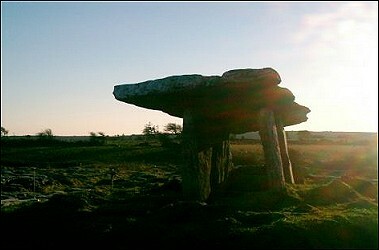 It features as sleuth Mara, the Brehon of the Burren. Now in late middle age, Mara continues to serve as a judge dispensing justice under Brehonic law and also solving mysteries. A new judge metes out unduly harsh sentences to five miscreants and is then found gruesomely and creatively murdered. Naturally the five offenders are suspects, as is a very young widow, and others who have motives. Mara must investigate the crime, although it has taken place outside her usual jurisdiction. 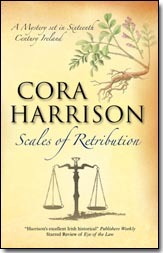 "As she sifts through too many suspects, the reader may discover the murderer early on, but Harrison is an expert at laying false trails, and the true resolution isn’t revealed until the end of the book. There is a really dramatic seacoast scene that will leave readers reluctant to dip a toe in the Atlantic ever again. As usual with this series, the scenic Burren and adjacent areas are characters in themselves. The story stands alone, but readers may want to obtain earlier titles to follow the characters’ back stories." By the mid-western Atlantic seaboard is one of the most magical places in Ireland. It is called The Burren and geologists, botanists, nature lovers, mountain climbers and cave explorers come from all over the world to see this place. and above all by the ancient walls of Cahermacnaghten law school (pictured left) where, right up to the reign of Queen Elizabeth I, the Brehon laws were taught and were used to keep the peace in the community which had lived on the Burren for thousands of years..